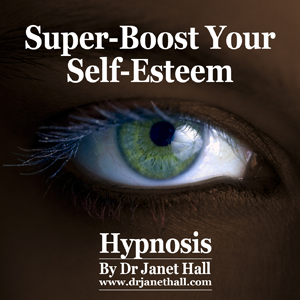 This Dr Janet Hall “Super-boost Your Self-Esteem with Hypnosis” recording contains a deeply relaxing and highly effective Ericksonian Metaphor that communicates with the unconscious (subconscious) and programs it for peace and serenity. Often called “Story Telling” hypnosis, this method is one of the most effective and powerful forms of hypnosis because it generally eliminates the conscious mind’s propensity to block suggestions. Suggestions hidden within the metaphors are “generalized” by the unconscious, so that the mind makes its own interpretations and finds its own meanings in them. That allows the metaphors to have a maximum positive effect on YOU. The story holds and DISTRACTS your conscious attention, which allows the hidden suggestions to slip into your unconscious more easily. You are a positive, happy and proud individual. You are attractive to others. You reflect a sense of positive well-being. You are calm, positive, directed. Feel how wonderful it is to be admired. Allow yourself to feel proud. Be pleased about your accomplishments. Be pleased with yourself. You are a competent and worthwhile person. You are lovable and capable. You feel your own goodness. You can recapture the feelings of worthiness anytime you wish. Be Persistent – keep listening and you will have great self-esteem! So, if you’re serious about wanting to have great self-esteem then you need to get a copy of “Super-boost Your Self-esteem With Hypnosis” right now!